In this unit you will learn to describe the study of environmental science, how we define sustainability and what constitutes the scientific method. You will also learn the concept of systems in nature, the different properties of matter and the various forms of energy. Note: Students are expected to know content for chapters 1 & 2 prior to the start of the semester. Students should have read these chapters and completed the pre-semester assignment to turn in on 2/110. There will be a quiz on these chapters on 2/1/19. Notes that correspond to Ch 1& 2 can be found below. Identify key environmental indicators and their trends over time. 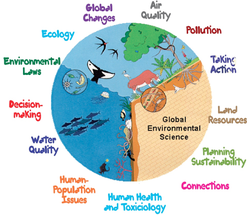 Identify environmental problems, their causes, and controversy over their seriousness. Define sustainability and explain how it can be measured using the ecological footprint. Describe how matter comprise atoms and molecules that move among different systems. Explain why water is an important component of most environmental systems. Discuss how matter is conserved in chemical and biological systems. Distinguish among various forms of energy and understand how they are measured. Discuss the first and second laws of thermodynamic and explain how they influence environmental systems. Explain how scientist keep track of energy and matter inputs, outputs, and changes to environmental systems.